Just giving a shout out to Andrew from precision. My new 3D printed grips arrived today and I shot with them this afternoon. Andrew did an outstanding job I cannot thank him enough. I will have to agree. Andrew went far beyond with my order. 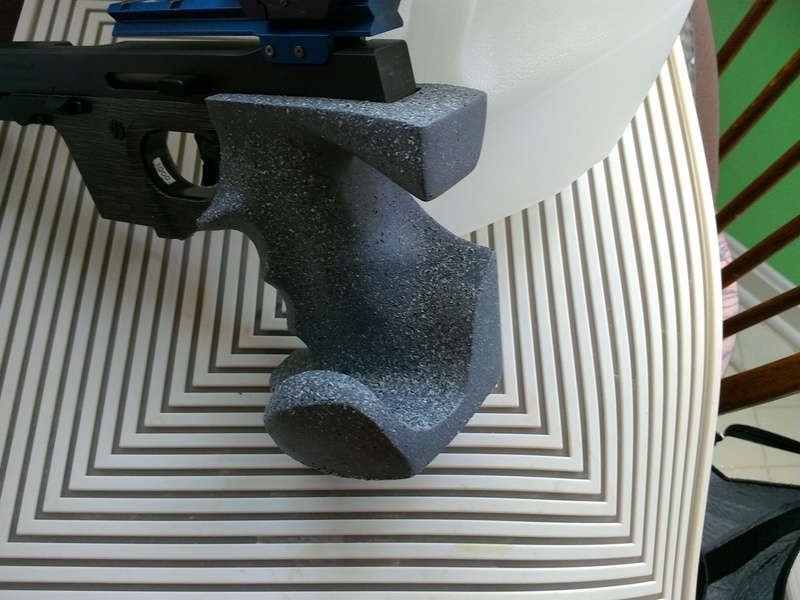 I had a Nill grip I liked on my Benelli MP95E. I had just bought a Walther GSP and the stock grip was terrible. I sent him my Nill and he scaned it and through his perseverance He made it fit my GSP. I am very happy with the results. It fits my hand perfectly. Order a grip from Andrew, you won't be disappointed. Hi there! I also bought a Walther GSP custom grip from Andrew. 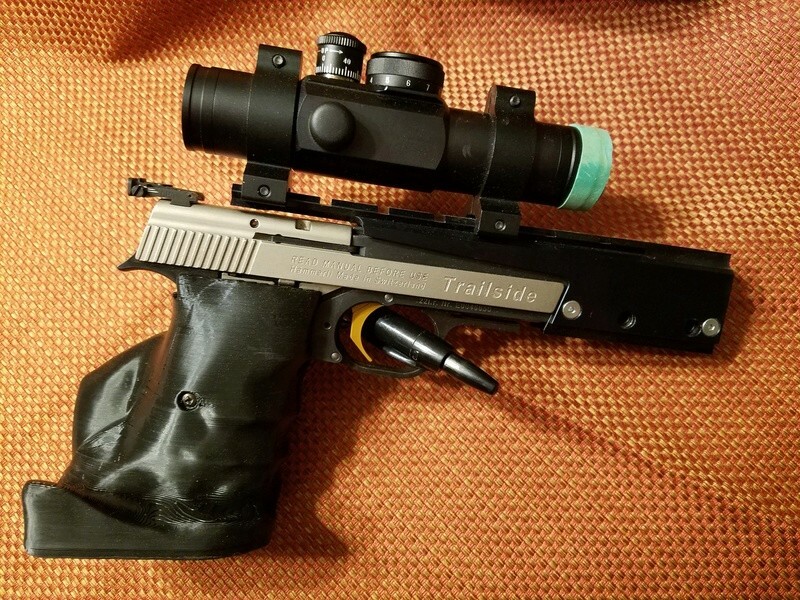 He worked with me to get everything just right due to some fitting issues with a Nill grip adapter (I have an older Walther with the original grip screws on the side of the frame---I had no idea this would affect the grip fit). The new grip has really helped tighten up my groups...after taking it to the range, I shot some of my best offhand groups ever with the gun. 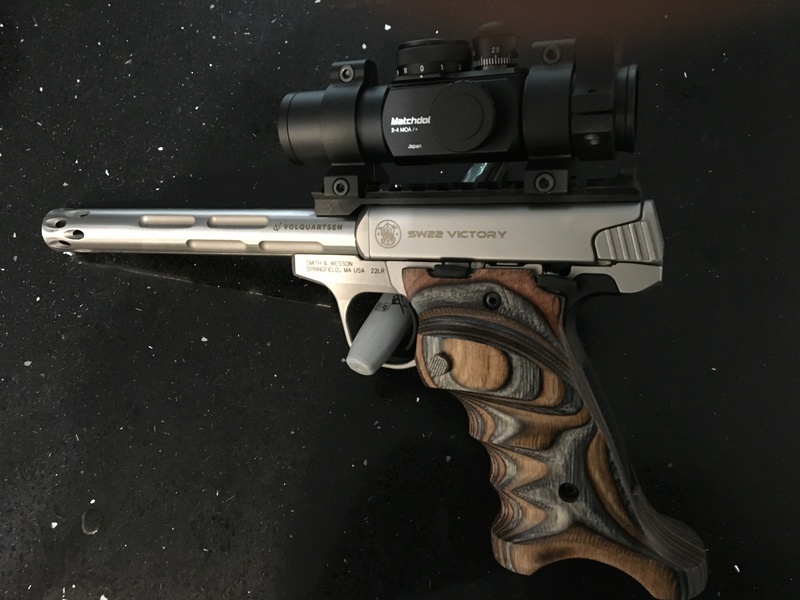 Just placed an order to Andrew to refit/upgrade my S&W Victory to a custom LH Bullseye grip. (And no... the Victory shown on his page is not mine). Been waiting for LH grips from Volquartsen... grew tired of waiting after several emails and repetitious delays for LH shooters. 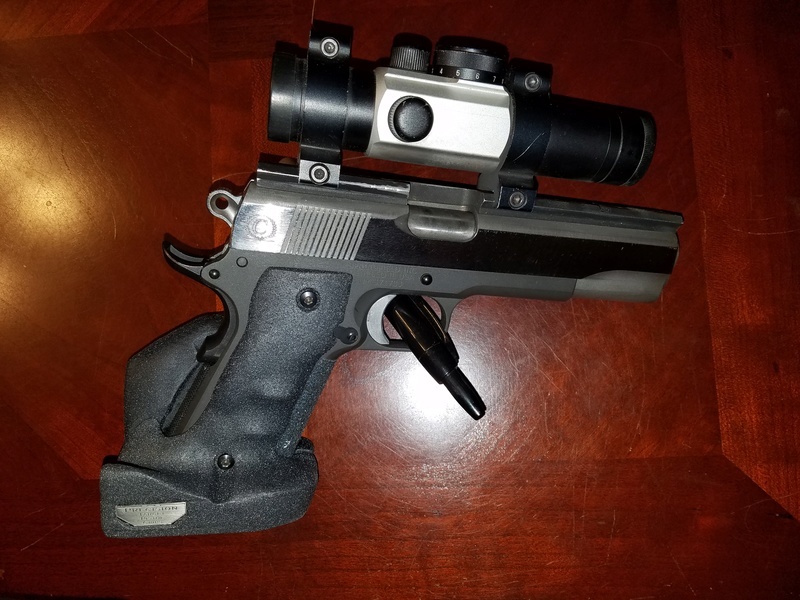 I’ve been driving Andy nuts the last few weeks trying to get a set of grips for a revolver to match the grip shape and angle of my ISSF RF pistol. He came up with a pretty elegant solution. Back in 1969 Volkswagen had an advertizing campaign for their bug. The add had a picture of the lunar lander with the text “It’s ugly, but it gets you there!”. Andy’s grips kind of remind me of that. They are not pretty like a highly figured wood grips would be but they fit like a glove, and the price and service is excellent. Andrew did my grips last month and I absolutely love them. Also, his customer service is first rate. Spoke to him several times on the phone as he called me with questions as to my questionable measurements and such. The end result was wonderful. Highly recommend Andrew for anyone wanting to try Precision grips. I love the paint job on these grips. I am in process of ordering some grips from Andrew now and have been trying to figure out how to paint them. Are these his grips? Did you paint them? If so, do you care to share what paint you used on them and any other finishing tips you might have? For the same price - Andrew designed and sent me a custom built measured (left hand) grip based from my physical dimensions. Objectively - its is a no brainer considering the same cost factor with a better fit and customer support. It is not a paint job it is laminated hardwood. Check out some of the colors on VQ website. I bought the grips more for their looks then their function. I also have laminated 1911 target grips from Altamont that look much the same. BTW hardwood rifle stocks and shotgun stocks are my favorite. I used to make and also hand checker wood stocks. Don BTW I made stocks in high school wood shop bet you couldn't do that now. Even brough the barrels and actions in for in-letting. S&W Victory Customised with Tandemcross and Volquartsen Firearms elements. Hey all, another shout out to Andrew at Precision Target Grips. My wife just received two sets, one for her 1911 and the other for her Sig Trailside. She wanted to get as close as possible to the same feel from each which, since they are obviously quite different guns, was difficult. She and Andrew exchanged numerous emails accompanied by pictures and cad drawings and he put up with her (much) better than I do. The result...a matching set that are nearly identical in feel and finger reach to the trigger. They also make both guns point extremely naturally with no need to search for the dot. He was unbelievably patient and quick to make modifications to the drawings and get back to her. As someone else said, as they come, they are not as pretty as a nice set of Rinks or a high end wood set but, I spent a few minutes with some sandpaper and sprayed them with a black and tan textured spray paint, the same as the pictures above I believe (Rustoleum Multi Colored texture in aged iron color), and they look great now. I still have to paint the Trailside but I have enclosed a picture of both sets so you can see before and after. My 1911 style Precision grips from Andrew arrived today. Installed on my Pardini SP22BE in a few minutes and dry fired. Perfect fit on the gun and more importantly in my hand, JMB had it right the first time over one hundred years ago. I ordered a set of the same for my Baikal IZH 46 shortly after. Thanks Andrew, glad to have you in our camp.